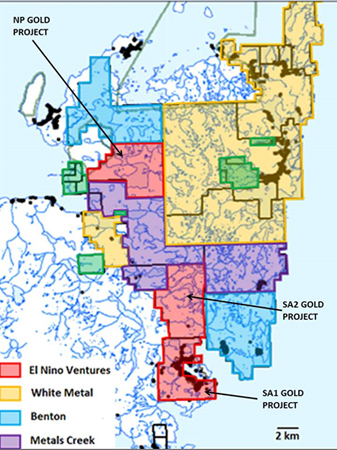 January 9th, 2018 Vancouver, BC - El Niño Ventures Inc. ("ELN" or the "Company") (TSXV: ELN; OTC Pink: ELNOF; FSE: E7Q) is pleased to announce that it recently acquired, through staking, 100% of three gold projects in the Great Northern Peninsula of Newfoundland (Figure 1). The claims were staked to follow up on the new Gunner Cove gold discovery of White Metal Resources. The three new gold projects are the NP Gold Project, SA1 and SA2 gold projects. The new land position contains geology similar to that of White Metal Resource's new gold discovery, Gunners Cove. The company is presently planning a program with follow up field work planned for the spring of 2018. The three claim blocks are situated around the city of St. Anthony and northward (Figure 2), covering approximately 22 kilometres of favorable geology, similar to that being encountered on the Gunners Cove Project to the east and north of the company's three gold projects. The claim blocks consist of 218 claim units for approximately 18,980 hectares (46900.41 Acres). The White Metal Resources recently announced (Newsfile Corp. - November 20, 2017) significant amounts of highly anomalous gold assays over an area of 15 kilometres in black shale units of the Hare Bay and Goose Tickle Formations. Michael Stares, President of White Metal Resources states in the November 30th, 2017 news release that; "Of the 156 rock samples, 99 were collected from the main area of the black shale unit. On the basis of the results from the 99 samples, the Company has expanded the gold (Au) mineralization to the north by approximately 3.75km, to the east-northeast by approximately 3.2 km, and to the south by about 1.3 km. 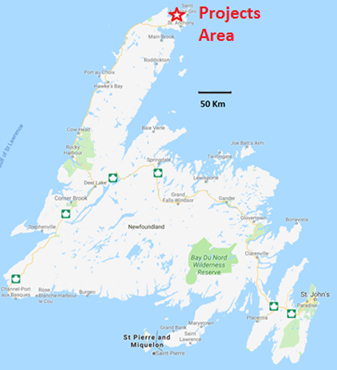 Approximately 50% of the grab samples collected in the Gunners Cove area assayed 100 ppb Au (0.1 g/t Au) or greater, with a maximum of 2.14 g/t Au. Silver assay results are also elevated, ranging from less than 5 ppb Ag to a maximum of 9.1 g/t Ag (note: grab samples are selective by nature and are unlikely to be representative of average grades). Our recent work at the Gunners Cove Property has highlighted a large area of anomalous gold values and extended the discovery area substantially. Historically, this Property has seen very little exploration work (minor prospecting), adding to the importance of this new gold discovery. Precious metal mineralization is associated with and appears to be largely hosted by pyritic nodules and stringers accompanied by minor silicification and local brecciation, and hosted by an extensive black shale unit." ELN President and COO Trevor Richardson states; "The Company is excited to have three new gold projects and exploring the gold potential of the Great Northern Peninsula of Newfoundland. Newfoundland is a treasure chest of mineral possibilities and is a mining friendly jurisdiction. We look forward to working in Newfoundland as well as assessing new projects that will fit the El Nino strategy." El Nino Ventures Inc. (ELN) has in the past years been an international base metals exploration company with its focus being on the Murray Brook Project in the Bathurst region of New Brunswick, Canada. The Company also has an Aggressive Mineral Acquisition Program Underway with a focus on gold and base metal projects that are a mix of grass roots, brownfields and advanced stage projects. The Company plans to use the Prospector Generator Model which reduces risk, share dilution and increases discovery potential. The contents contained herein that relate to Exploration Results or Mineral Resources is based on information compiled, reviewed or prepared by Carey Galeschuk, P.Geo, a consulting geoscientist for El Nino Ventures. Mr. Galeschuk is the Qualified Person as defined by National Instrument 43-101 and has reviewed and approved the technical content of this news release. Cautionary Note Regarding Forward Looking Statements: This release contains forward-looking statements that involve risks and uncertainties. These statements may differ materially from actual future events or results and are based on current expectations or beliefs. For this purpose, statements of historical fact may be deemed to be forward-looking statements. In addition, forward looking statements include statements in which the Company uses words such as "continue", "efforts", "expect", "believe", "anticipate", "confident", "intend", "strategy", "plan", "will", "estimate", "project", "goal", "target", "prospects", "optimistic" or similar expressions. These statements by their nature involve risks and uncertainties, and actual results may differ materially depending on a variety of important factors, including, among others, the Company's ability and continuation of efforts to timely and completely make available adequate current public information, additional or different regulatory and legal requirements and restrictions that may be imposed, and other factors as may be discussed in the documents filed by the Company on SEDAR (www.sedar.com), including the most recent reports that identify important risk factors that could cause actual results to differ from those contained in the forward-looking statements. The Company does not undertake any obligation to review or confirm analysts' expectations or estimates or to release publicly any revisions to any forward-looking statements to reflect events or circumstances after the date hereof or to reflect the occurrence of unanticipated events. Investors should not place undue reliance on forward looking statements.